Ok, based on your new image and explanation I think we finally understand what's your goal. However it's not that easy to get it working for every kind of cubic bezier curve. The main issue is that certain points can have more than one point that is on the perimeter. Bezier curves aren't linear in it's nature which makes it quite difficult to get some uniform pattern analytically. The best approach is to do some sort Newton's method to approach the desired point. So you would just nudge forward along the curve and measure the distance between your last point and the current position. Once distance is too large you would decrease the step size and nudge back until you are again below the target distance. Repeat to get as close as you want to your target distance. One problem is that if your curve has a small sharp turn and your step size is too large that you jump over a possible solution and pick the next intersection instead. If that's not an issue this is probably the best solution. Since the "density" of the curve changes as you walk along the curve it's best to measure the relative distance after each step to adjust the step size accordingly. // normalized step size to achieve about 1/10 of our target length. This is untested and should be seen as a pseudo script example. thanks for the explenation, makes now more sence to me. just didn’t quite figure out what C and t stands for, could you give me a hint? "C()" simply stands for your curve function. So it's just the bezier function and the parameter is the normalized "t" value (0 to 1). "t" is just the normalized position along the curve. So you would start with a value of "0". Note that the code i've shown is just the code to calculate the "next point" on the curve. I just realised i had already posted something similar over here, though the question was a bit different. He wanted to get the closest position on the curve from a given point. well I've tried out your code and for a moment I've got the next step in the curve. 0.001f = smooth working accurate (between 0.1 and 0.2 difference). 0.0001f = still smooth working accurate (between 0.01 and 0.02 difference). 0.00001f = buggy working accurate (between 0.001 and 0.002 difference). Runs in an editor script. Basically I want to get the most accurate result, but I need the best Performance. It's explained in this article. EDIT: Ah, now I understand what you meant (I'll leave the previous answer because it might be helpful for someone else). Unfortunately I think this might be quite a difficult problem. It's surely possible but it probably involves some nasty integrals. Depending on your requirements, an approximate solution might be enough. Here is one, it's a bit ugly but it kinda works. It takes any curve (could be Bezier), the number of subdivisions you want to perform and a value that determines how accurate the approximation will be. It returns an array of values such that evaluating the curve with those values yields evenly spaced points. Thank you for your example Code, this didn't do the Trick for me!. this would give me 10 Vector3 WorldPosition on the Bezier. 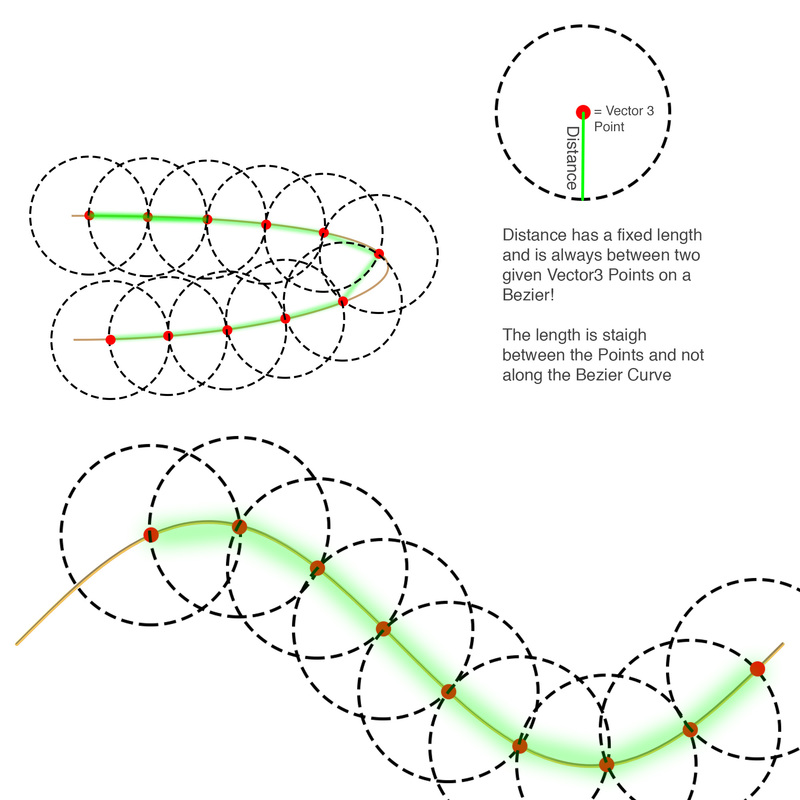 But if the Bezier is curved, the Distances between those WorldPosition is no more for Example 5. @coeusueoc well I think basically it's the solution you provided! and it's approximately enough. the only thing I'm worried about is if the curve turn's extremely sharp. the distance between the SubdividedParts will be off the expected result. you can see in the Picture below, Distance 2 is 7.53.., and not 18.64.. like the other's is there a way to avoid this? like setting restriction on how much the Bezier can be curved? Actually the distance is correct. The distances are meant to be along the curve. The curve segment at the sharp turn has approximately the same length as the others. You just calculated the direct connection between the points. Since it's a curve it's in its nature to have different direct distances between two points on the curve depending on where you put them. Some curves may need more "approximationSteps" than others. Those which sharp turns or extreme unpropotional segments need more than a "curve" which isn't "curved" that much. If you don't understood what i meant, just imagine you double the subdivisions (so you just get another intermediate point on the curve between the current points). That means you get a point at the tip of the sharp curve. The distance betwen that tip and the two neighbors are approximately as long as all the other segments. So his example works as intendet. Maybe you have something else in mind, but you have to be more clear in that case what you actually need. Can you take a picture of your curve and manually draw the marks where you want them to be? @Bunny83 well yes you both are right about the distances, they’re indeed correct if you take the length from the bezier. 603 People are following this question.